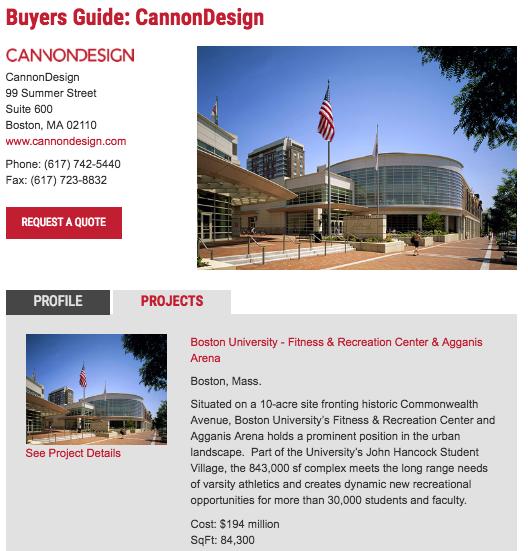 Example: CannonDesign conducts one of North America’s most active specialty practices in planning and design for sports, recreation and wellness. Our activities range from master planning and programming, and the assessment, renovation or expansion of existing facilities, to the development of new sports and recreation centers for colleges and universities, municipalities, corporations, healthcare institutions, and fitness clubs, worldwide. Your logo will appear on every page of your Portfolio, as well as in the Profile promotion. You may submit materials for up to four projects.